What is that sound you hear, coming from a long distance, of notes bending in ways that you could never dream of doing on your own? The smooth and easy transitions and waviness of the sounds that feels almost hypnotic. You might think it might not be achievable with human fingers, and you will be right. It is the sound of a guitar being played with a slide, a piece of equipment that you could wear on your ring finger of your left hand, to achieve the effect. Slides are a popular accessory to have and have been used widely in the history of the guitar. Though they can be used to play on normal acoustic or electric guitars, there are guitars made specifically for slide playing, the resonator guitars. Whichever way you prefer to play it, the best guitar slides are incredibly fun tools to enhance your playing, definitely something you should consider picking up. There is a reason that some of the most trusted products have specifications that conform to the most demanded products. Selling and making so many copies of the same thing results in the eventual perfection of the process and the production of highest quality products. Dunlop has been making glass slides for a while now. 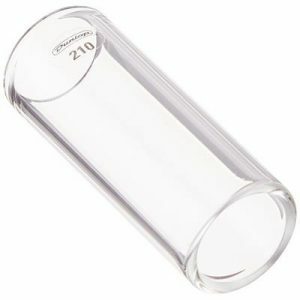 The Dunlop 210 Tempered Glass Slide is the sum of all their experience, poured into a glass. While you might think it doesn’t take much to create a slide, reality thinks otherwise. This item has been tampered for strength and durability, so that it has less of a chance to shatter to pieces if you happen to drop it. The slide has the perfect weight for a full sound, while the smoothness of the surface allows for smoothness of the guitar’s tone. A great, affordable, full finger glass slide if you are looking to pick one up right now. The very first bottleneck slides were a rough creation, hardly comparable to the smooth and easy playing that the slides today provide. The seams on the bottlenecks, grain in the glass and the uneven, heavy surface meant that the blues players using them had to pay great attention to hand positioning and the way they held the slide. When someone tries to compare their product to the original bottlenecks of once upon a musical time, I tend to wonder whether this means their product is not as good as they would like to be, in comparison to others available on the market. 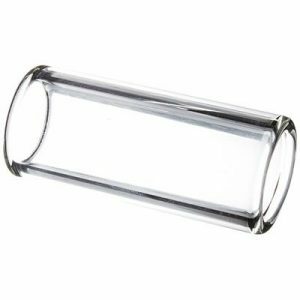 The Ernie Ball medium sized glass slide tries to draw this comparison and fails, since it is far superior to the original bottlenecks. It is smooth, well weighed and seamless, allowing for easy play and a good sound. Despite this and the affordable price, this slide is not the best on the list, though still being one of the better medium sized slides offered on the market. 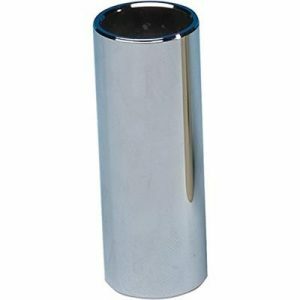 Steel is a favored material for guitar slides for the one reason – the positively wailing sound that the guitar will be made to produce with the help of them. They are durable, smooth and a lot of fun to play, though good ones are hard to find since the market is littered with slides. In the case of the Fender Steel Slide, Standard Medium, I can say that you have found one slide that will never let you down. The slide is sturdy and smooth, allowing you enjoyable playing and an even more enjoyable sound. The size of the slide is rather standard, while weighed a little heavy for fullness of sound. The one thing you do have to make sure before you buy this slide is that your finger fits. If it doesn’t than don’t randomly complain about how actually hard the slide is to use. It is not, you just have fat fingers, no offense. While there are those who like to compare their glass slides to the bottlenecks of the past, there are also those who take it a step further. They design their glass slides to look like actual bottlenecks from the past, achieving both the look and sound of vintage glass slides. Doing so is not easy, as simulating bottles from the beginning of last century might take a lot of practice and looking for the right materials. When done right, the manufacturer earns my respect for dedication and success. 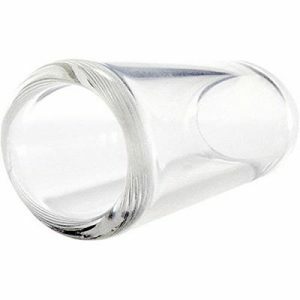 The Planet Waves Glass Bottle Slide is one of the few products that has been done well enough for me to call it one of the best glass guitar slides available on the market. The look is vintage, based on an old medicine bottle. The slide itself is light, sacrificing the fullness of the tones for the sustain and speed of play. This means that your guitar will be unleashing a wave of beautiful wails effortlessly with this piece of equipment. If you have ever tried to push a wall of balance, you will know that it is pretty much impossible, if the wall is made right. Imagine having a wall strapped to your finger, when playing a guitar then and how impossible it would be to push your sound off balance if you did. The deepest, heaviest, fullest sounds could be achieved, only if it was possible to get a finger wall. While not literally, the Clayton Heavy Wall Large Guitar Slide offers you the chance to have a figurative wall for your finger. This glass slide is large and heavy, for those of us looking for the fullest sound they can achieve across all strings. While being heavy, the slide is comfortable and will fit most fingers with ease. When playing with it your main concern should be whether you are playing the song you want to be playing, because the hard part will be taken care of by the slide. The slides, originally, were intended to be used on guitars specifically to be played as slide instruments. Steel guitars, resophonic guitars, lap steel guitars and lap slide guitars are instruments dedicated to slide playing. The sound these instruments produce are highly enhanced by the addition of the slide, especially a steel slide, bringing the metallic resonance of these guitars to a whole new level of impressive. A guitar does not have to be dedicated to slide playing for a slide to be used on it. Normal acoustic and electric guitars easily lend themselves to the sound enhancements provided by the slide, meaning that anyone can benefit from one of these. There are generally three types of slide manufactured around the world. Glass, ceramic and steel, each one having specific effects on the sound that the slide produces. 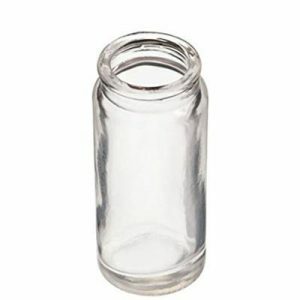 The glass material is currently the most popular for guitar players, but even in the case of glass, the variation in sound is caused by the color and weight of the slide, so careful consideration is needed when buying one. Glass is by the most popular slide materials use for non metallic slides. While the resonance and tonality of glass might be great, one of the biggest reasons for its popularity is the fact that glass is so easy to get and make at home. You might have heard some slides referred to as bottlenecks at one point or another and, if you didn’t know anything about them, been surprised. The truth is that the first slides were made of simple materials and one of the easiest materials to access was a bottleneck. The first bluesmen would use a hot wire to melt the bottleneck off of the bottle and then end up using those as slides. While you have the option of doing that as well, it might not be the most optimal way to go about getting a slide. After all, the seams on bottlenecks and the uneven surfaces some of them have will end up affecting your sound and playability. Though if you want a dirty, gritty sound, a seam might be nice. The true benefit of a glass slide lies in the clarity, smoothness and warmth of the sounds produced when using it to play. There is a high variety in the glass slides – long, short, thick and thin, all of which you will have to decide on depending on your style of play. You also might want to consider the color since adding a metallic alloy to make the glass green will also result in heavier glass and deeper, fuller tones. Metal is by far the most popular, and most often seen in pop culture, material for a slide. If you’ve ever seen a blues player use a slide, it is highly probable that he (or she) was using a metal slide. The large number of metals used for the creation of slides offers a great variety of resonance and sound. The most popular material is, you guessed it, steel. Producing a heart wrenching, shrieking, bright, strong sound, it is one of the prime choices for bluesicians. The second most popular choice is brass, thanks to its deep, soulful sound. There are numerous other metals with which you should definitely experiment. Ceramic slides are very similar in sound to glass slides, and tend to be way more brittle. The beautiful thing about ceramic slides is how much you can customize them. It is your choice whether you want them to have a smooth or rough finish for different effects on your music. The history of the slide is fascinating because of how rustic and slightly campy it is. The beginnings of the slide are lost to the history of country and blues music. Was it an accidental creation, a result of a bar brawl. Someone broke a bottle, cut their finger, but still needing to play – put the bottleneck on their finger and voila! Probably not how the story went, but the fact remains – the origins of the slide are lost to the history of the musical instrument. Whatever it is the slide has accompanied the steel string acoustic guitar and the resonator, lap steel guitars throughout the popular culture. 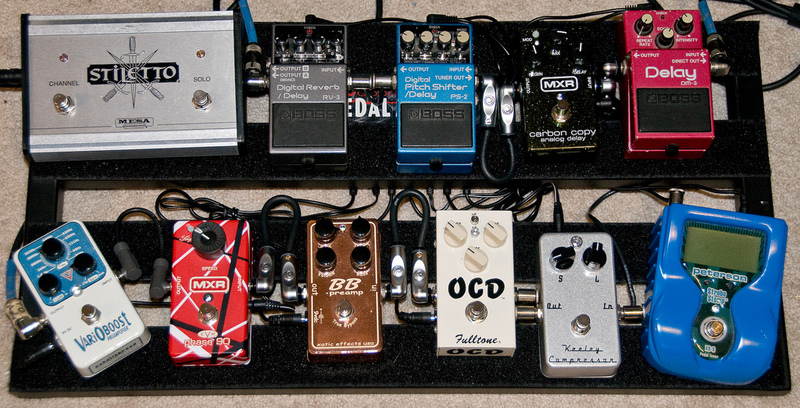 The unique effect on the sound is one sought after and hoped for by many guitar players. The true beauty of the slide is not in its history, but in the layer of unique musical depth it adds to your performance. The best guitar slides, when used correctly, produce an almost unique musical effect on the listener. It can be both haunting and energetic, fun and emotional. The idea is that you need to be able to determine how much you would like to customize your slide for optimal sound. Determining the material, color, level of roughness and grain, the weight and the length of slide might seem a little pointless at first, daunting as second, but in the end will prove to be a worthy time investment, as you end up playing something you find to be great. Good Luck!